correctly, text will appear in console. Requires : XP/VISTA/W7 32 bit. The Kartoffel-Hack Project is still alive, but I’ve changed some things. I’ve closed the blog and the forum. The Haunted is a fast paced thirdperson horror-action game with focus on a intense multiplayer experience that is all about making a stand and liberating cursed places from the minions of evil. The game features several multiplayer modes such as coop or demons .vs. humans where enemies are spawned and controlled by players. The outstanding visuals lay a perfect tone for the gameplay. 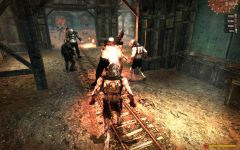 Playing as human is action focused survival gameplay with a huge arsenal of weapons and melee attacks in the vein of Resident Evil, but with total freedom in movement and more intense, direct combat. Undead humanoid monsters come in many variations and approach from everywhere to give you the feeling of a real fight for your life. There is no place to hide, together or alone. In addition to that, watch out for dangerous traps and environmental hazards. The locations feature an almost mystical atmosphere, provided by awesome graphics and effects. Damage is shown on the characters with blood splatter, dirt and scars along with post processing effects and physical hit animations. Coop Mode: Up to 4 human players have to make a stand against the undead. A setup tool for easy installation is included, but before playing: READ THE README! We need your feedback now more than ever! So please post comments here on ModdB or visit our IRC channel. #HauntedGame at QuakeNet. This release has a vastly improved multiplayer experience, so we are glad about anyone who hosts a online server! Many thanks to all betatesters and people who supported us. Special thanks to Nervous Energy for the server hosting, Helltrain for the trailer and eLowar for the installer.